I don't like those readymade onion rings but these I will definately try. We all probably need to eat more onions, but unfortunately I cannot bring myself to eat them like an apple! However, fried onion rings are more than welcome. I like the light cornmeal coating here-Yum! I would like to try these. I liked the fact that you used the cornmeal. They look light. I have some nice Vidalia's on hand I might try with this recipe. Thanks for posting it! I love onion rings!! They are our favorite appetizer to order when we go out! Hi Just for Cooking, Vidalia onions would be good with this recipe. If I had vidalia onions on hand, I would have use vidalia onions. Vidalia onions are so good. Onions are one of my favorite vegetables! I love them in all preparations - yours look pretty darn good! Onion rings are my indulgent food, better than french fries. My grandmother prescribed them-onions, plain and simple-as an aide to lactation! I love cornmeal with my onion rings, too! I wish there was a clear claimant for onion rings. As usual, your research was top-notch! Thanks! Hi Ann, I wish there was a clear claimant too. Thanks you, Ann! Onion rings are alsays a welcome at my dining table! The way you made them is droolworthy! You did so much research on Onion rings and onion! Really good info for the readers. Thanks! These look delicious and I need to try them! I always forget about onion rings! Wow you were busy researching, I do love a good onion ring from time to time. They look great. These onion rings look so crispy. I think that the addition of cornmeal to your recipe makes the differece. Thanks for sharing. Oh, onion rings are one of my weaknesses...and yours look so crisp and fabulous! Interesting history of onions...especially how revered they were in Egypt! You do such great research on the history of foods...so interesting to read about their origins. 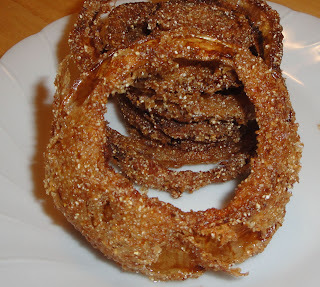 Love the onion rings with the corn meal addition, so crunchy and yummy!!! Onion rings are a real treat and vidalias make the best ones. Thanks for all the research yo do. Wow, what a great and informative post. I love, love onion rings. Only tried making them once and it was an epic failure. You are inspiring me to try again. I love onion rings, but haven't attempted them myself. I've bookmarked this one! Such an interesting post! I have not mastered the art of onion-ring-making, but I do love to make them as you can add all sorts of interesting spices to the mix and come out with some cool combos. The information on onions was great. I had no idea they had such a history! Hey everyone, I wanted to take a moment and thank you all for all the wonderful comments. Comments mean a lot to me. I could go for a batch of these onion rings right now! Wow, very nice about the detailed article about food, I like this. And anyway, thank so much for visiting my blog, I really appreciate it super.